August Jansen was one of those artists who did not spend even one day studying at the Pallas Art School yet supported the development of the Pallas-style school in every respect with his art. 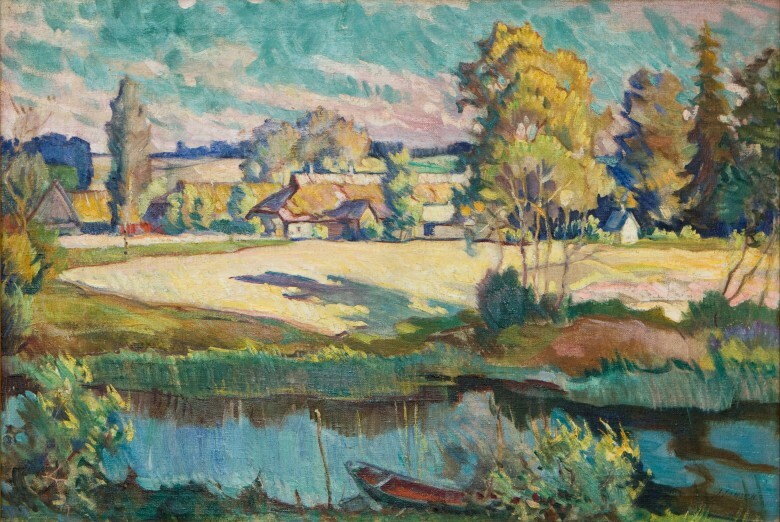 In an interview he gave in 1930, however, he admitted that his teaching work and other such activity prevented him from concentrating on his own creative work and thus he had to devote himself to painting primarily in the summertime. He also said that he painted landscapes as if in passing since “that isn’t work that would satisfy his artistic senses; those draw him to more serious tests of strength, to the creation of compositions.” He was an artist in his fifties who actively participated in exhibitions, organised artistic life and created a number of paintings in different genres. Though he did not rise to the centre of the interest of critics of that time with his art, Jansen was nevertheless an artist whose works could not simply be ignored either. 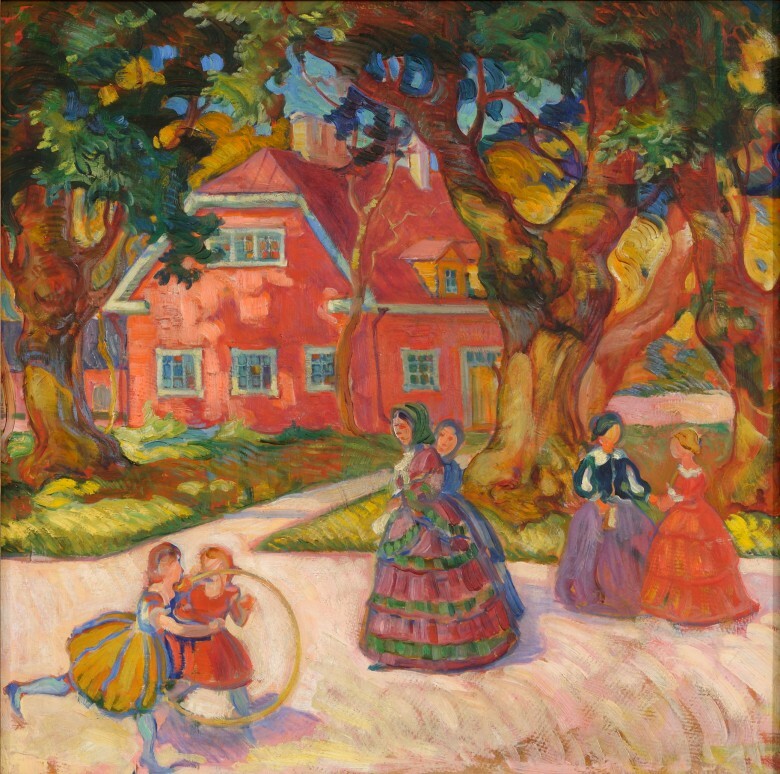 This work probably depicts Kadriorg Park in Tallinn. Jansen has painted this subject – a little house visible through the trees of a park – on several occasions. Jansen had a personal relationship with Kadriorg Park: his apartment-studio was located there, as was the case with many other artists (August Weizenberg, Jaan Koort, Karl Burman, Johannes Greenberg and others). It is interesting to note the old-fashioned clothing of the women and the art nouveau style treatment of the trees, which would seem to indicate that the painting was completed not in the 1930’s but rather decades earlier. The first half of the 1940’s offered August Jansen somewhat more opportunity for vacationing than usual. As an avid organiser of artistic life, he had been the point person of various initiatives during the preceding decades. In the 1940’s, however, he went back to work as a teacher. Jansen has depicted this subject a great deal over the years. The traditional Estonian farm complex situated in the bosom of nature is not a fantasy but rather clearly has a specific location. Namely, Jansen often spent his summer vacations in Põllküla (20-30 kilometres from Tallinn), where Evald Puhk, one of the most important entrepreneurs of the 1930’s, allowed him to use his cottage. Both the cottage and the watermill belonging to Puhk were situated by the river and this work was probably completed somewhere in that area. It has been stressed that Jansen started using colours differently than he had until then in the early 1940’s: colours no longer contrast each other sharply. Instead, he seeks a colouring borne by a uniform, prevailing primary tone. August Jansen painted himself often and through several decades. As a rule, he looks the viewer straight in the eye in his self-portraits, yet in this work we only see the artist’s profile. His buttoned-up coat, turned up collar and thick hat further reinforce the feeling of detachment and being cut off. 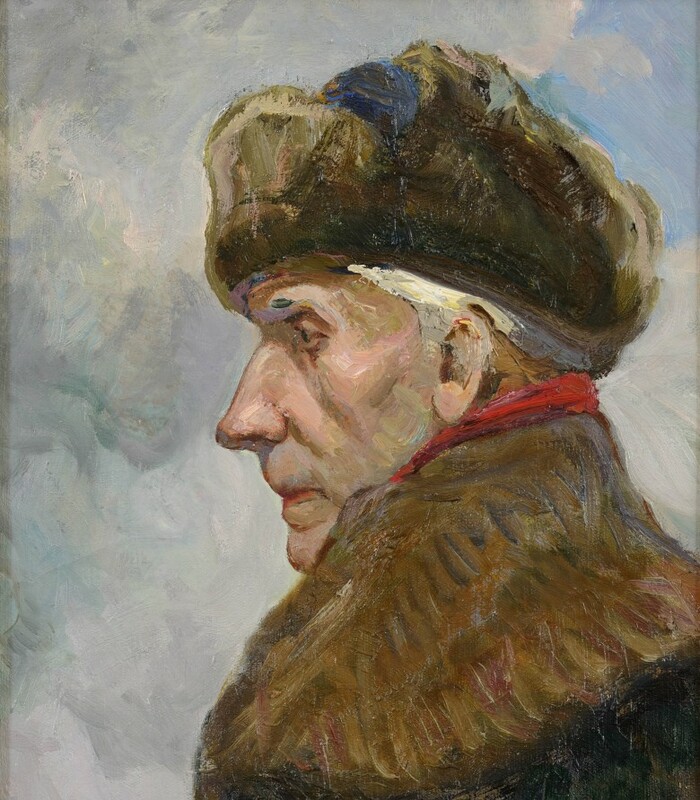 The artist is already over 70 years old in this painting and this is probably one of his last self-portraits.